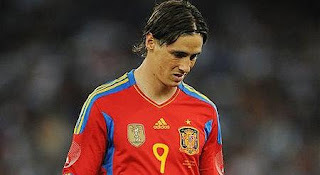 Chelsea face a nervous wait to discover the full extent of the injury suffered by Fernando Torres last night. The Spaniard is a doubt for Chelsea's Premier League opener against Stoke on Sunday after limping off during Spain's 2-1 defeat to Italy. Torres was replaced by Fernando Llorente after only 14 minutes with what appeared to be an ankle injury, but it was later revealed that the Spain striker had suffered mild concussion and had been sent for a scan. Medical staff are expected to examine Torres before offering a further assessment. Already they are insisting that his withdrawal was purely a precaution. However, if Torres has suffered concussion, he would seem likely to be forced to sit out of the trip to Britannia.